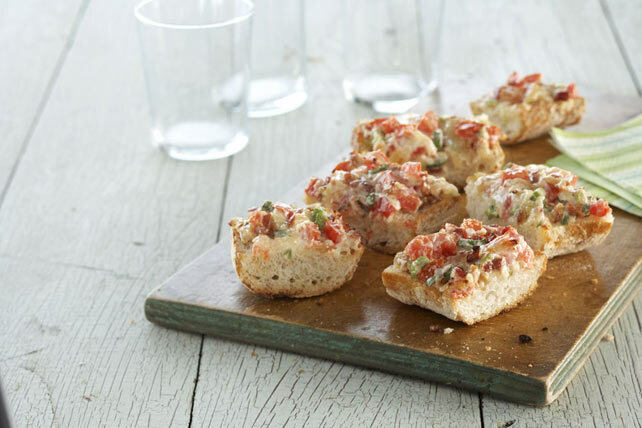 Try a twist on a classic with Bacon Bruschetta Baguette. Cheesy garlic bread with tangy MIRACLE WHIP Dressing make Bacon Bruschetta Baguette a can't miss. Combine all ingredients except baguette halves; spread onto baguette halves. Place on sheet of heavy-duty foil. Grill 8 to 10 min. or until cheese mixture is hot and bubbly, and bread halves are toasted around the edges. Heat oven to 375ºF. Spread baguette halves with dressing mixture as directed; place on baking sheet. Bake 15 min. or until cheese mixture is hot and bubbly. For additional browning, place baguette halves under the broiler for the last 1 to 2 min. of the baking time. Prepare using OSCAR MAYER Real Bacon Recipe Pieces. Prepare using MIRACLE WHIP Light Dressing and KRAFT 2% Milk Shredded Italian* Three Cheese Blend.